Ukrainian President Petro Poroshenko speaks to a crowd ahead of the presidential elections on upcoming April 21, at the Olympic stadium in Kyiv, April 14, 2019. With reporting by Christopher Miller in Kyiv, RFE/RL's Ukrainian Service, AP, AFP, and Reuters. Ukrainian President Petro Poroshenko arrived at Olimpiyskiy Stadium in Kyiv for a presidential election debate even though his challenger, Volodymyr Zelenskiy, has said he will only agree to spar with Poroshenko at the stadium five days later. Poroshenko is to face Zelenskiy in Ukraine's presidential runoff on April 21. Zelenskiy won the first round earlier this month by a large margin, and most, if not all, opinion polls put him well out in front of the incumbent ahead of the final vote. Both candidates have agreed to hold a debate, but disagreed on the date. Zelenskiy insists the debate take place on April 19 while Poroshenko wants it held on April 14. Poroshenko, accompanied by his wife and children, walked inside a glass-encased room sandwiched between the stadium and the adjacent hotel where dozens of journalists were waiting. He took to the stage, with the moderator off to the side. They welcomed Zelenskiy as well but noted his absence. Ukrainian comic actor and presidential candidate Volodymyr Zelenskiy flashes a victory sign following the announcement of the first exit poll in a presidential election at his campaign headquarters in Kyiv, March 31, 2019. "It was not me who proposed the site of the event, it was a certain man," Poroshenko told the audience, standing next to an empty lectern bearing Zelenskiy's name. He then addressed Zelenskiy, saying, "I know you're watching," and added, ironically, that Zelenskiy must be having a rest after his trip to Paris where he met French President Emmanuel Macron. Poroshenko also called on Zelenskiy to show up at the stadium, saying that otherwise he would invite him to a televised debate every day. Asked by a reporter if he would cooperate with Zelenskiy if the latter won the presidency, Poroshenko replied, "If, God forbid, he were to be elected, that would still be the choice of the Ukrainian people and I would respect that choice." The stadium has confirmed it also received a request to hold a debate on April 19, leaving open the possibility that Zelenskiy will show up on his preferred date and speak to supporters alone. There also weren't any spectators in the stadium, though a large crowd of about 1,000 people stood outside to listen to a broadcast of Poroshenko's statements and his answers to journalists' questions. The campaign has been marked by theatrics on both sides, including public moves by both candidates to be tested for drugs and alcohol. According to a statement on April 13 on the Ukrainian presidential website, press will be admitted to Olimpiyskiy Stadium in Kyiv on April 14 starting at 1 p.m. local time (1000 GMT/UTC), 15 minutes before what it says is the start of the scheduled debate. Most likely, if Zelenskiy doesn't show up, the event will turn into a Poroshenko rally. On April 12, Poroshenko traveled to Berlin and Paris to seek international support ahead of the April 21 runoff. 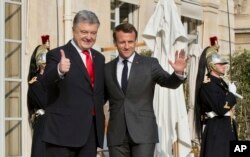 Zelenskiy traveled only to Paris, where he met French President Emmanuel Macron, who separately met with Poroshenko as well. In Berlin, Poroshenko met with German Chancellor Angela Merkel, who praised the "very close relations" her country has built with Ukraine in recent years. At a joint news conference, Merkel deflected a question about the impression that she favors Poroshenko in the election. She said that she was in "permanent contact" with the incumbent. 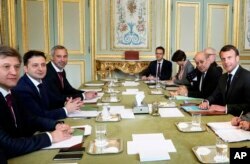 Germany, France, and Ukraine are part of the so-called Normandy Format of countries seeking a resolution to the conflict in eastern Ukraine, where Russia-backed separatists are fighting against government forces. Ukraine's President Petro Poroshenko, left, is welcomed by French President Emmanuel Macron at the Elysee Palace in Paris, France, April 12, 2019. Macron first hosted Zelenskiy, who told journalists that his meeting with the French president was held in a "very nice, warm atmosphere." Ukrainian comic actor and presidential candidate Volodymyr Zelenskiy, left, and French President Emmanuel Macron meet at the Elysee Palace in Paris, France, April 12, 2019. 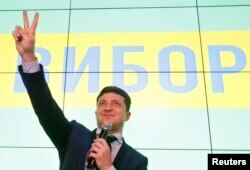 An independent poll released on April 11 suggests that Zelenskiy enjoys a commanding lead ahead of next week's runoff. The Sociological Group "Rating" said its polling early this month points to 51 percent popular support for sitcom star Zelenskiy, who appeared on the political scene late last year, versus 21 percent for Poroshenko. The race was even more lopsided in Zelenskiy's favor among respondents who intend to vote in the second round of the election -- 61 percent to 24 percent.